Marchionne wants to match the size and scale of VW Group. GENEVA -- Fiat is scouring Asia for a possible partner after the planned alliance between General Motors Co. and PSA/Peugeot-Citroen shrank the pool of European candidates. Fiat CEO Sergio Marchionne said teaming with either Suzuki or Mazda makes sense. "Those two companies would be complementary to Fiat's activities," Marchionne said at the Geneva auto show. "We talk continuously with Suzuki; we talk with Mazda; we talk with everyone." Fiat already supplies engines to Suzuki. The Fiat Sedici small crossover is built in Suzuki's factory in Hungary. Hideki Taguchi, a Suzuki spokesman, declined to comment on a potential tie-up with Fiat. Mazda said it has no plans to have another capital alliance but it is "aggressively" encouraging more partnerships. Marchionne is searching for a third partner after merging with Chrysler Group to help reduce development costs and boost sales in fast-growing countries. Fiat and Chrysler only sell half the cars Marchionne said is needed for long-term survival. Marchionne's options in Europe are narrowing following the GM-PSA deal, with most of the region's carmakers already in alliances and nine of Europe's auto and truck brands part of Volkswagen. An Asian alliance would also help in Fiat's weakest region, which accounts for 3 percent of revenue. Asia accounts for 44 percent of global deliveries, according to Bloomberg Industries. While alliances don't always provide the anticipated savings, Marchionne said in January that carmakers need to consolidate to compete with VW Group, which had a 23.3 percent market share in Europe last year. He told reporters last week that there aren't "many partners left" in the region. Adding a new alliance or joint venture is "not a priority" for Ford, Stephen Odell, the automaker's Europe chief, said in a March 5 interview. Hyundai also has no plans to set up a strategic partnership in Europe, Allan Rushforth, the South Korean carmaker's chief for the region, said Tuesday. "There aren't many more opportunities for alliances following recent developments," said Dieter Zetsche, CEO of Daimler, which has an industrial partnership with Renault. "I don't think we will see many other alliances; there is only really one player who might. There aren't so many they could do it with." That has left Marchionne, who said he's still open to a European deal as well, to pursue options in Asia. To create the necessary car-making efficiencies, automotive groups need to build 8 million to 10 million vehicles a year, Marchionne has said. Currently only GM, VW and Toyota are producing at or near that level. Mazda, Japan's most export-reliant carmaker, said March 5 it will raise as much as 151.2 billion yen ($1.9 billion) in a record share sale to replenish capital as it braces for its biggest annual loss in 11 years. Mazda President Takashi Yamanouchi said last month that the company was "aggressively" looking for a partner. "Mazda has a capital alliance with Ford and technical alliances with seven different companies worldwide, and for now, we have no plans to have another capital alliance," Kozue Nitta, a Mazda spokeswoman, said Tuesday. "However, to supplement our products, technology and/or business in various regions, we want to aggressively encourage more partnerships." Suzuki, whose Maruti Suzuki makes almost half of the cars sold in fast-growing India, began arbitration procedures in November aimed at ending its two-year-old partnership with VW. Each company has accused the other of breaching their cooperation agreement, which was meant to supply Suzuki with technology and provide VW with access to the Indian car market. "Asia's more likely to be where we'll see partnerships because of the growth and more fragmented nature of the Chinese market," said Itay Michaeli, an analyst for Citigroup Inc. in New York. "There are some Asian manufacturers that could use some regional support from a global automaker." Fiat-Chrysler earned 3 percent of revenue in Asia-Pacific last year, compared with 37 percent in Europe and 45 percent in North America. Asia accounted for 5 percent of operating profit. Fiat controls Chrysler with a 58.5 percent stake. Fiat, which froze new European investments after losing 500 million euros last year in the region with its volume car business, doesn't expect a recovery until at least 2014. The Italian carmaker relied on Chrysler for all of its net income in 2011 as U.S. sales climbed 36 percent, the CEO said last month. "Marchionne has a great footprint now in the U.S.," said Gary Silberg, a Chicago-based KPMG automotive researcher. "He's got to figure out his problems in Europe with Fiat. Why would he want to double down there? So Asia seems to make a lot of sense." GM and PSA announced last week a broad alliance that will include joint purchasing and vehicle development in an effort to revitalize their European operations. GM will buy 7 percent of the French carmaker, which will sell new shares in a 1 billion-euro rights offering. 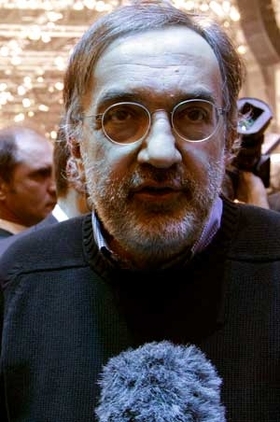 Marchionne held talks with PSA regarding a possible combination in 2009. The discussions ended because the Peugeot family didn't want to lose control over the carmaker, a person familiar with the matter said last month. GM in 2005 paid $2 billion to Fiat to exit a failed five-year partnership. Four years later, Marchionne held unsuccessful talks with the Detroit-based company to buy its Opel unit in Germany. "For something as large as what the industry needs to do to fix all of Europe, I just wonder if these alliances are enough," said David Whiston, an analyst with Morningstar Inc. in Chicago. "It certainly may be a great starting point."